China stocks closed at their lowest levels in a month on Monday as growth stock earnings disappointed and investors brushed off optimistic statements from China's policymakers at the weekend's G20 summit of global financial leaders. And while a rapid surge in property prices in China's largest cities is supporting real estate counters, analysts say it could drive investors to switch out of stocks into property in the longer-run. The blue-chip CSI300 index closed down 2.4 per cent on Monday at 2,877.47 points, having touched the lowest level in nearly 15 months during intraday trade. A late-afternoon gain in banking shares helped the index narrow its losses. The Shanghai Composite Index shed 2.9 per cent, to 2,687.98 points, pressing against the intraday support level in late January around 2,638 points, and Hong Kong shares closed down 1.3 per cent in line with their mainland counterparts. "Money keeps flowing out of stocks, where investors see little reason to go upward further," said Shen Weizheng, fund manager at Shanghai-based Ivy Capital, arguing that the "wealth effect" of investors moving their spare cash into cities such as Shanghai, Nanjing and Hangzhou was diverting liquidity out of stocks. At the same time, disappointing earnings reported by many small-cap growth stocks on the ChiNext index, which are popular with retail investors, have created wider investor concerns. Monday's slide adds to losses accrued during a sharp drop on Thursday, when indexes shed over 6 per cent. The sequence of falls onshore have already punched through the false bottom indexes found in late August, when Beijing mustered a "national team" of institutional investors to buy shares to restore a bull market. The government's response to market turmoil has thrown Beijing's market management into question. While the government replaced the chief stock regulator earlier in the month, the leadership change has done little to restore confidence. Having given up all the gains earned from the intervention, indexes are continuing to slide with the "national team" now widely believed to have given up supporting struggling markets. This has raised investor uncertainty over where support for markets is likely. 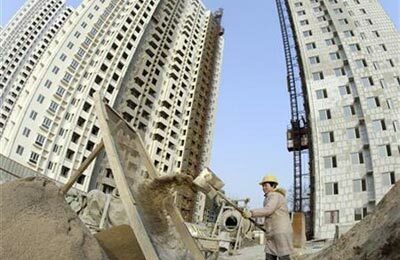 Analysts blamed much of Monday's drop on weekend news about Shanghai property, with media showing investors queuing up at government buildings to register new sales. Key real estate indexes outperformed the wider market, but still ended the session slightly lower, with analysts warning that signs of overheating investment in first-tier property markets - in particular Shanghai and Shenzhen - signalled the beginning of a longer migration out of China's volatile stocks back into property.